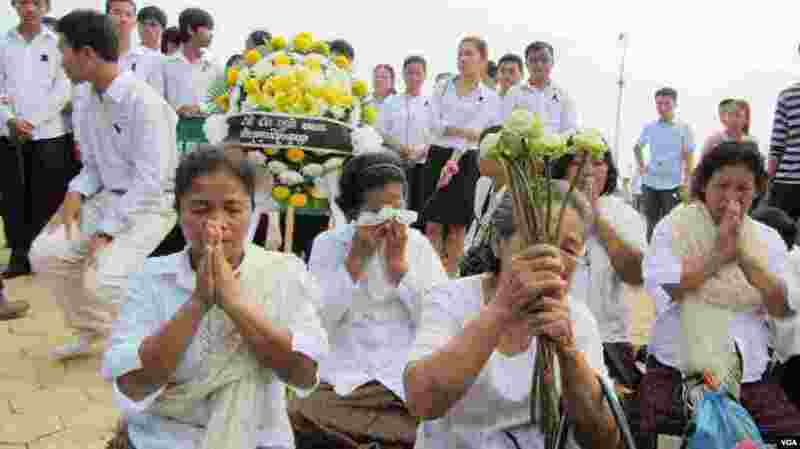 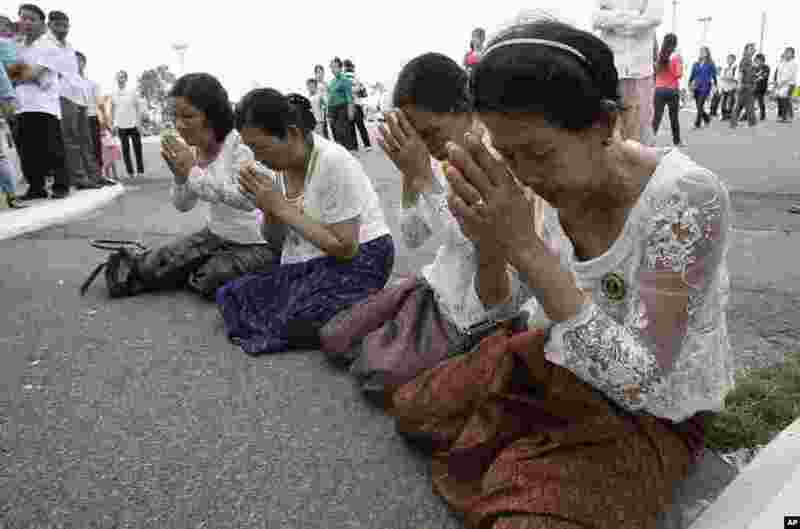 5 Cambodians pray in front of the main gate of the Royal Palace in Phnom Penh, Cambodia, to mourn the death of former King Norodom Sihanouk, October 15, 2012. 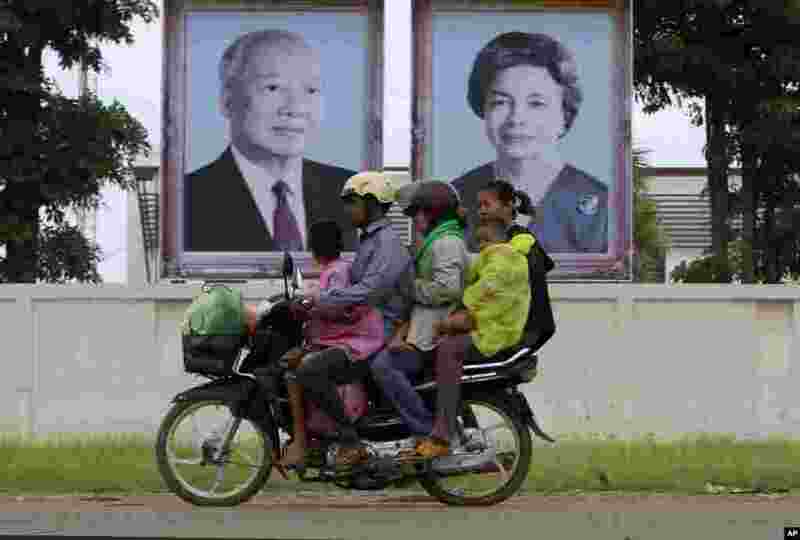 6 Cambodian family members ride on a motorbike as they head back from their home village, passing by portraits of former King Norodom Sihanouk, left, and his wife Queen Monineath, Phnom Penh, Cambodia, October 15, 2012. 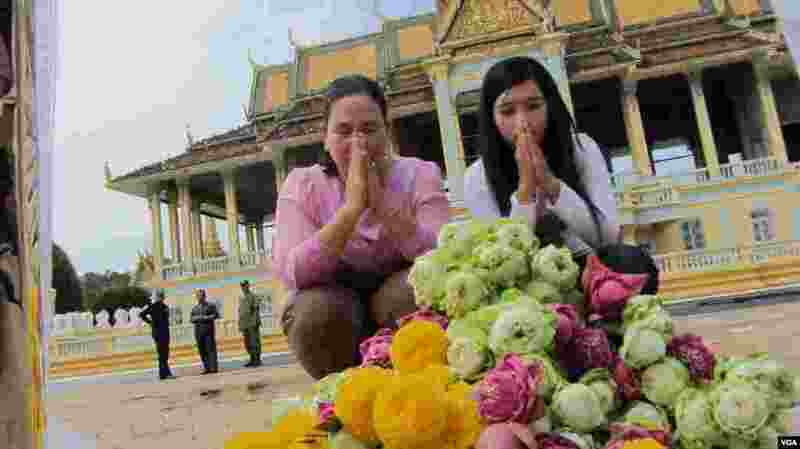 7 A Cambodian woman prays in front of the main gate of the Royal Palace in Phnom Penh, Cambodia, to mourn the death of former King Norodom Sihanouk, October 15, 2012. 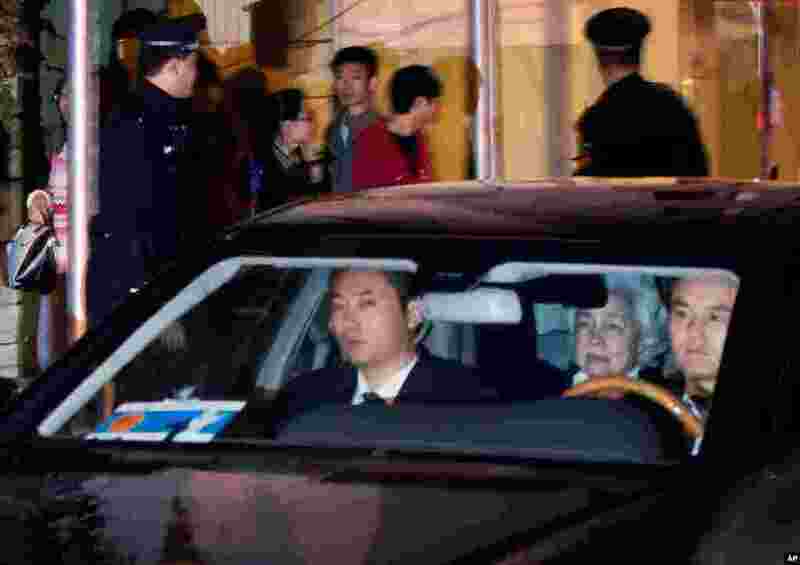 8 Monineath Sihanouk, wife of former Cambodian King Norodom Sihanouk, sits on the backseat of a car upon arrival at a hospital where the king received treatment, in Beijing, China, October 15, 2012. 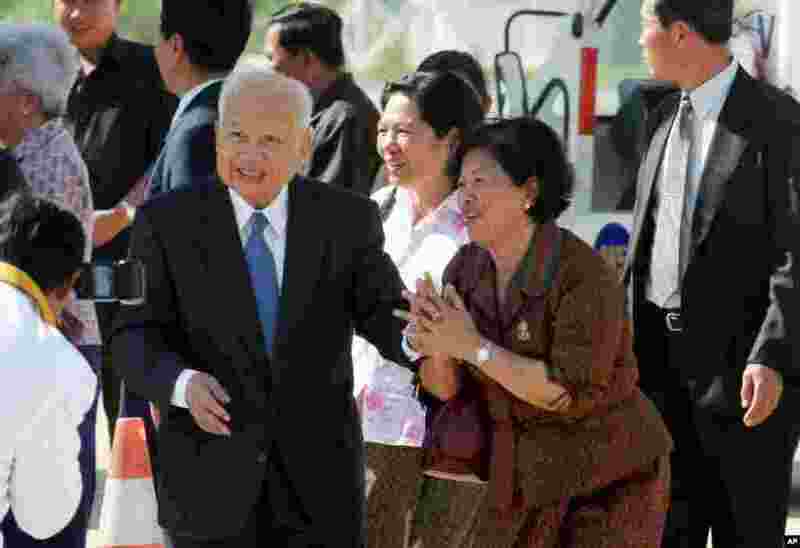 9 Former Cambodian king, Norodom Sihanouk, center left, greets well-wishers before his departure for China from Phnom Penh International Airport, Cambodia, in this September 2, 2006 file photo. 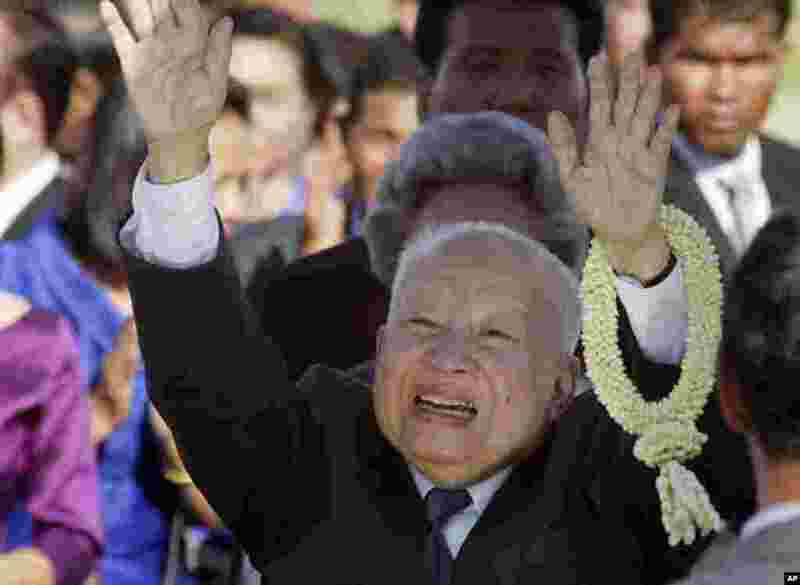 10 Former Cambodian King Norodom Sihanouk greets well-wishers upon his arrival at Phnom Penh International Airport, Cambodia, in this May 26, 2006, file photo. 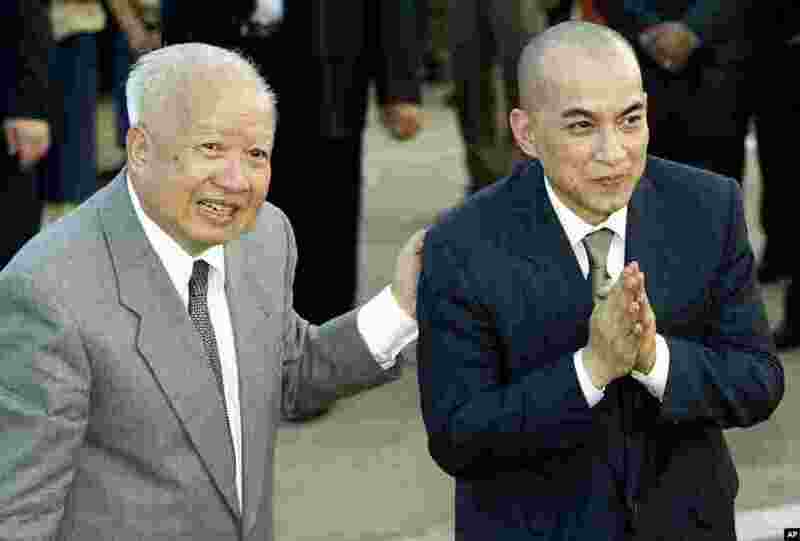 11 In this October 20, 2004 file photo, Cambodia's King Norodom Sihanouk, left, introduces his son and successor, King Norodom Sihamoni upon their arrival at Phnom Penh airport, in Cambodia. 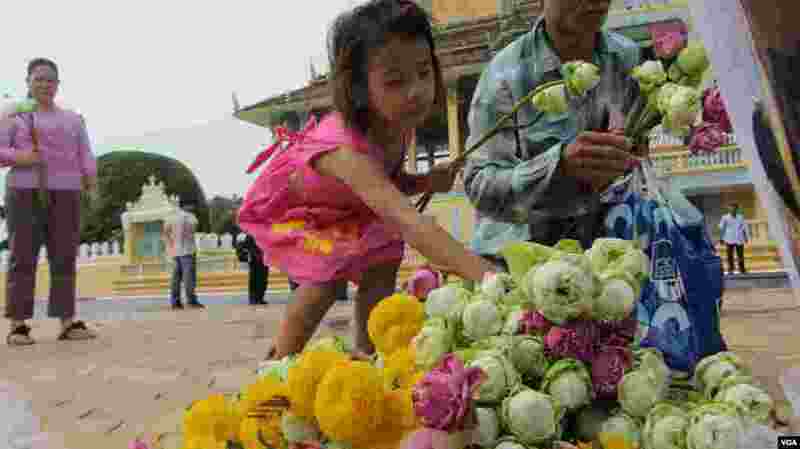 12 Cambodian King Norodom Sihanouk bids goodby to a Buddhist monk at a temple in Siem Reap, in northern Cambodia, on September 1, 1997. 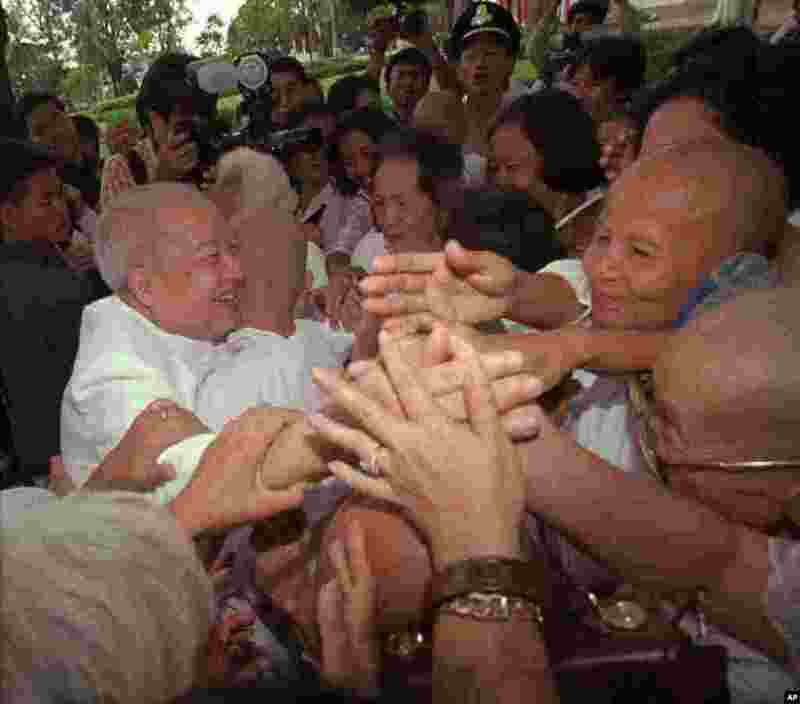 13 Cambodia's King Norodom Sihanouk is greeted by Buddhist nuns at a temple in Siem Reap on September 1, 1997. 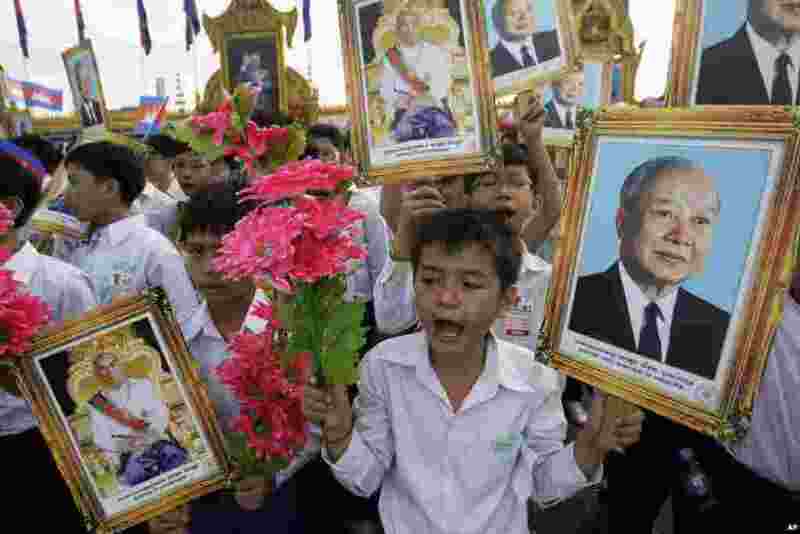 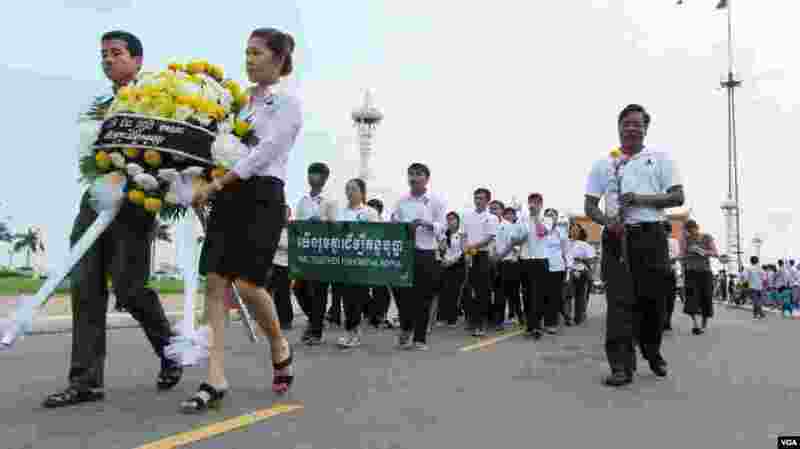 14 Cambodian students hold portraits of former King Norodom Sihanouk, right, King Norodom Sihamoni, and flowers during an Independence Day celebration at the Independence Monument in Phnom Penh, Cambodia, Wednesday, Nov. 9, 2011. 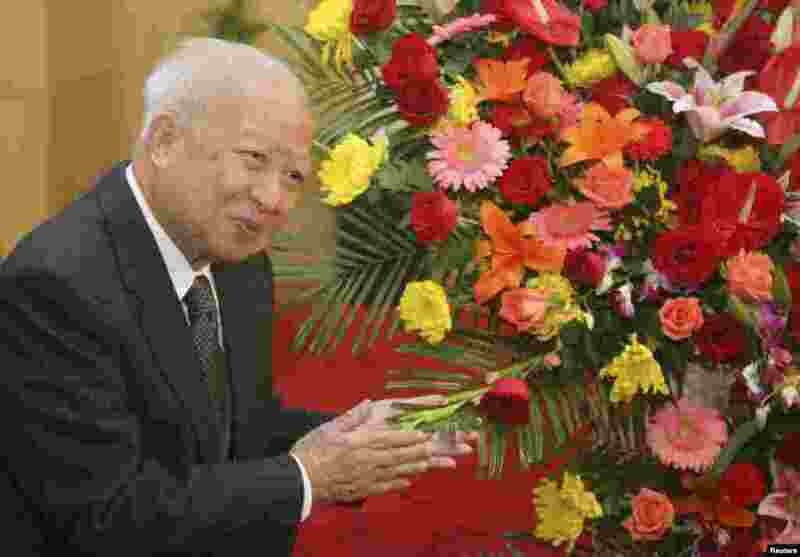 15 Then Cambodian King Norodom Sihanouk stands beside flowers given by the Chinese government during a meeting with Chinese State Councilor Dai Bingguo (not seen) in Beijing, October 30, 2006.